Aboubakar Omar Hadi Archives - Africa M.E. ABIDJAN (Reuters) – Djibouti is in talks with French shipping company CMA CGM to develop a new container terminal at an initial cost of $660 million as part of the tiny African country’s bid to expand into a sea and air transport hub for the continent. 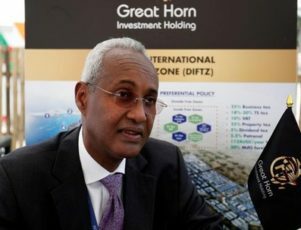 Aboubakar Omar Hadi, chairman of the Djibouti Ports and Free Zone Authority (DPFZA), told Reuters on Tuesday that the authority hopes to award the concession in July. It was also prepared to buy out DP World’s stake in an existing container terminal to end a row with the Dubai port operator and avoid arbitration, he said. Djibouti’s strategic location has led the United States, China, Japan and former colonial power France to build military bases there. Its ports already serve as an entry point for cargo which is then sent by smaller vessels to ports along Africa’s eastern coast, but it is now seeking to become a sea-air transshipment hub for the entire continent. To do this, Hadi said DPFZA was also planning to construct a $350 million airport and expand Air Djibouti’s fleet of cargo aircraft. The new container terminal project could break ground as early as September with construction expected to take 24 months, Hadi said, speaking on the sidelines of the Africa CEO Forum in Abidjan, Ivory Coast. The port authority was not in talks with any other potential partners, he said. CMA CGM did not immediately respond to a request for comment. Once operational, Hadi said the port terminal would boast an annual capacity of 2.4 million twenty-foot equivalent units (TEU), but subsequent expansion phases would bring that up to 4 million TEUs. Fifteen percent of the project’s cost will be financed through equity. Of that, the DPFZA will contribute 85 percent, with its concession partner providing 15 percent. The rest will be raised via international institutions and banks. “We are targeting trans-shipment,” Hadi said. Meanwhile, Hadi said the port authority was ready to end a dispute with DP World over its cancellation of a concession contract for another facility, the Doraleh Container Terminal, by buying out DP World’s 33 percent stake. Djibouti ended the contract with the Dubai state-owned port operator last month, citing a failure to resolve a dispute that began in 2012. DP World has called the move illegal and said it had begun proceedings before the London Court of International Arbitration, which last year cleared the company of all charges of misconduct over the concession.